On the hill ... we reflect. As a community with members from all over the world and a wide variety of religious traditions, FSHA celebrates the beauty and Veritas (truth) of every faith. Our rich diversity enhances the spiritual growth of the community individually as well as collectively. The tradition of St. Dominic de Guzman underscores everything that happens on the Hill. The Catholic Dominican Order, which he started more than 800 years ago in Spain, pursues the vision of Veritas (truth) through the four pillars: prayer, study, community and service. Students at each grade level participate in spiritual retreats led by adult and trained peer counselors. 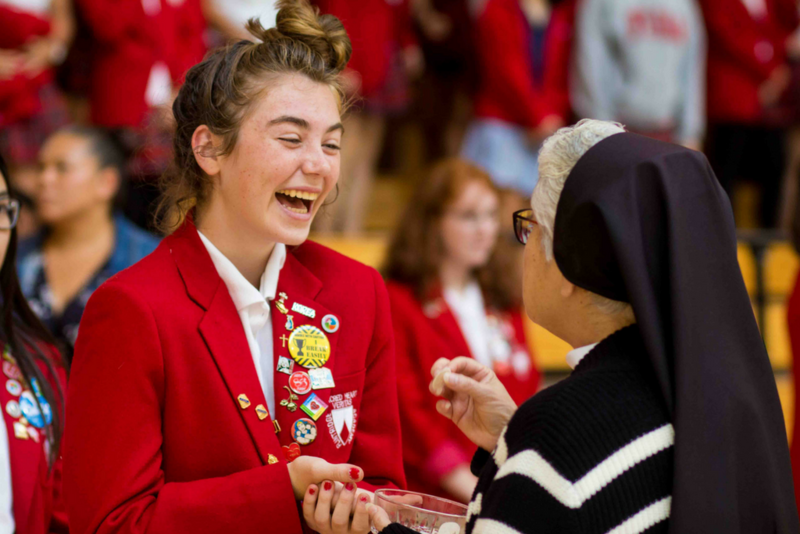 The spiritual journey that each FSHA student embarks upon begins her freshman year, with a one-day retreat with her classmates and continues through an extensive retreat program, liturgies throughout the year and religion classes. Retreats include a four-day retreat to Catalina Island for juniors and a four-day Kairos retreat for seniors. By the time she graduates, she is a young woman who understands and appreciates her value and the gifts that she brings to the world. The faculty campus minister trains students to minister during liturgies, prayer services, retreats and community service opportunities. Each grade elects its own campus minister to lead peers in prayer during class meetings, while the ASB campus minister embraces the campus at the beginning of each day with a prayer over the public announcement system. 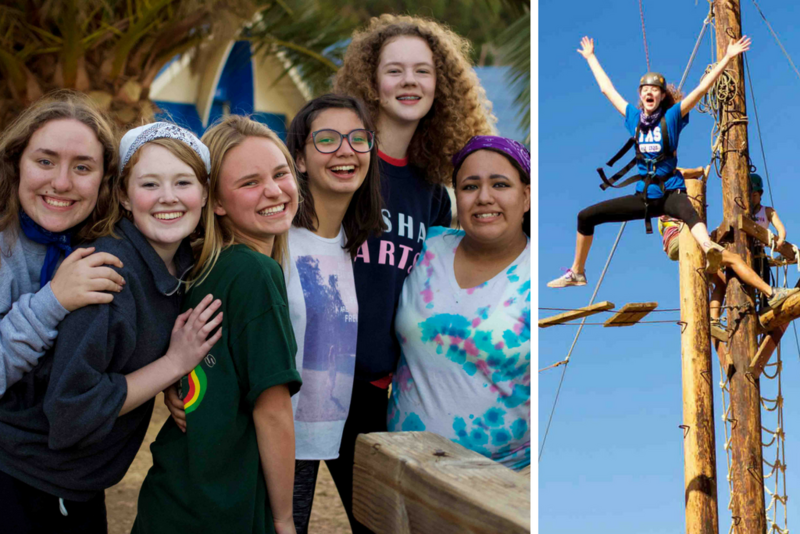 Students are trained as campus ministers, as journey leaders and as Kairos leaders — all of whom lead retreats. That’s perhaps not the image that comes to mind if you just say “faith” or “Catholic” or “spirituality” but I can think of almost nothing else when I think of the way I grew to know God at Flintridge Sacred Heart Academy. Spiritual stuff often gets painted (sometimes literally painted— think of all the stern saints you’ve see on the walls of churches) as this very serious and somber, quiet, personal and reverent thing, which it can be and is in many cases. But on the Hill and everywhere else since, I’ve come to know growing closer to God as unavoidably intertwined with a deep sense of joy. We set aside time in classes, assemblies, retreats and liturgies to join together in prayer. Special intentions for our students, families, community and world are remembered. Prayer is celebrated through spoken word, music and dance. 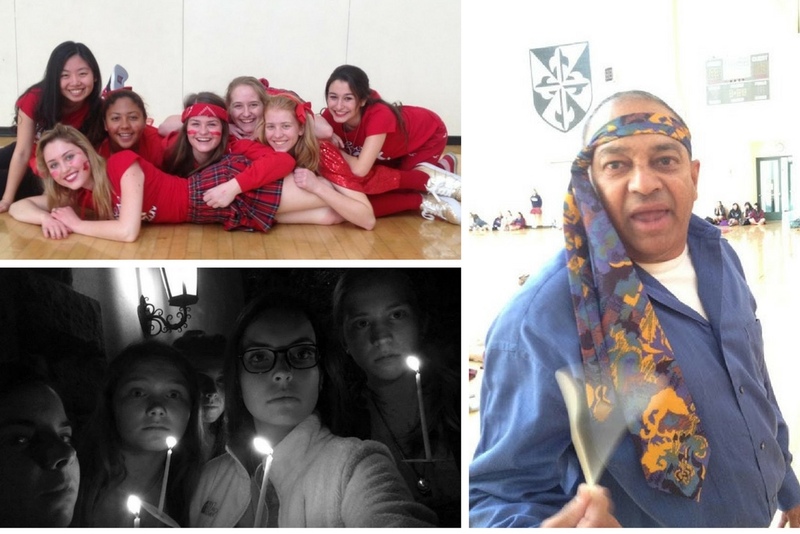 We cherish the fact that Flintridge Sacred Heart Academy is a faith community within an academic setting. This setting allows students to study faith and spirituality within four years of religious study. We celebrate our strength as a vibrant faith community, ensuring that we gather together to mark special religious, seasonal and academic occasions. Each grade gathers together multiple times during the year for retreats. We expect each student and family to give back to their communities. While each student must complete a minimum number of service hours in a year, many go above and beyond through their continued service to the poor, the young, the elderly, the disenfranchised and the earth. Students reflect on "Tattoos on the Heart"